Anthony Ndzabandzaba holds BA Law (Uniswa) and LLB (Natal/ Uvic) degrees. Anthony also holds post graduate certificates in Competition Law and International Trade Law. 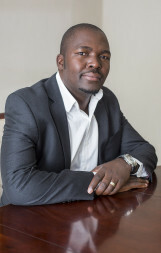 He was admitted as an attorney in 2004 and was previously a partner at Lowndes & Associates (now Lowndes & Dlamini). He was also a director at Edward Leonard Ndzabandzaba Inc. Anthony served as a Principal Legal Analyst at the Competition Commission of South Africa for almost four years. Anthony has vast experience in all areas of Competition Law, Municipal Law and general and commercial litigation in both the High Court and Magistrate Court.